The Rocky Horror Show is a crazy, campy, ridiculously fun show. And the perfect choice for this year's "Girls' Night Out at the Theater" (a yearly event I plan for my friends). But I must confess: I have never been to a midnight showing of the movie version of the show; audience participation is not my thing. I prefer to sit back and let the professionals do all the work. But that's not the way it works with Rocky Horror. The Rocky Horror Show originated as a stage musical in London in 1973, before making the leap across the pond to L.A. and NYC. It's been produced around the world, but most people know it for the 1975 cult hit movie The Rocky Horror Picture Show. The movie took on a life of its own at the midnight showings, where a whole script was developed for the audience to interact with the movie, complete with props like toast and playing cards, most of which I don't quite get. Stage shows of Rocky Horror have since incorporated some of the movie madness into the show, but fortunately for me, knowledge of all of the intricacies is not required. You can buy "audience participation kits" at the theater, and there are a few plants in the audience who yell the appropriate things at appropriate times. I have to admit, I found it a little annoying at first, like when the person behind you talks during a movie. But after a while I came to realize that it doesn't distract from the show, rather it adds another level of entertainment. The Lab Theater is the perfect venue for this show (the last show I saw there was this same team's production of RENT, one of my favorite shows of last year). You come down the stairway in the corner and enter a large open space with brick walls. There is bleacher style seating along two sides of the room, facing each other, with space in between where the action of the play takes place. There's no "stage" in the traditional sense, although there is a changing backdrop on one end. Actors move set pieces on and off the stage area, including a red circular couch and a cute little car. The actors do a great job of acting to all sides of the room (as directed by Andrew Rasmussen); you never feel like the action is taking place somewhere you can't see, but rather that you're observing it from above. The actors move into the aisles, so beware of aisle seats (or gravitate towards them, whichever you prefer). My one small complaint about the staging is that the band is not visible (I'm a band geek; I always love it when the band is on stage). It would have been fun if they were in a corner or on a platform somewhere, watching and being part of the action. This is an all-around fantastic cast, from narrator Don Shelby to the last member in the ensemble. I grew up watching Don Shelby on the news, but ever since his appearance on Letterman I knew he was much more than just a news anchor. He's a total ham, and a perfect fit for this role. He presides over the show in a Hugh Hefner smoking jacket, introducing scenes and playing with the audience. And at the end of the show, he joins the cast on stage, dressed appropriately. 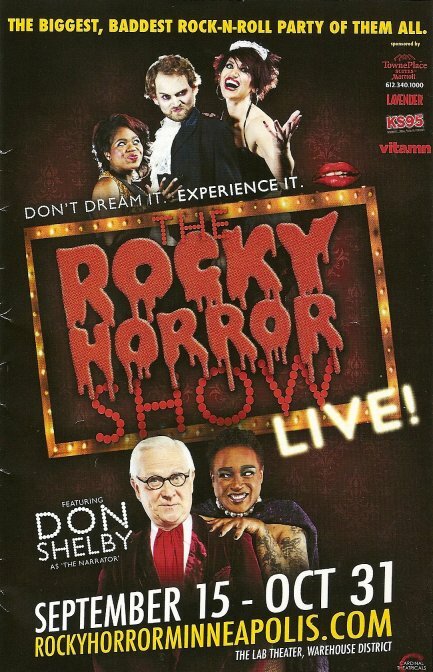 But the star of Rocky Horror is of course the sweet transvestite Frank-N-Furter, and Andre Shoals is fabulous. The "normal" couple in this world of misfits is Brad (Reid Harmsen, so wonderful as Mark in the aforementioned production of RENT) and Janet (the lovely-voiced Erin Capello). It's a difficult line to walk, to be the serious sincere ones in a campy, over-the-top show, and they do it well. Other standouts include Randy Schmeling as the creepy butler Riff Raff (a role I also saw him perform in the Ordway production of the show four years), and Molly Callinan as his sister (?) Magenta. She's a dynamic performer; you can't take your eyes off her. Craig Daniel Stastny as the sweet, simple, beautiful creation Rocky, Jamecia Bennett whose powerful voice soars in "Whatever Happened to Saturday Night," the list of talent goes on and on. 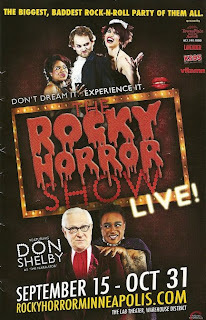 The Rocky Horror Show plays at the Lab Theater through Halloween (and I can only imagine how crazy that night will be). Costumes are encouraged; there's a contest at intermission. This is a really fun evening out, and it's a great thing to bring a group to (perhaps even a bachelorette party). Group discounts begin at a group of 10. I had a group of 17 and they treated us very well, including giving us a shout-out at intermission and reserving almost a whole row for us (we needn't have worried about getting there early to grab good seats). We had dinner before the show at the nearby Sapor Cafe and I would highly recommend it, especially for large groups. Delicious, fresh, interesting food, wonderful service, and good beer on tap; that's about all I need! Once again, "Girls' Night Out at the Theater" was a success.